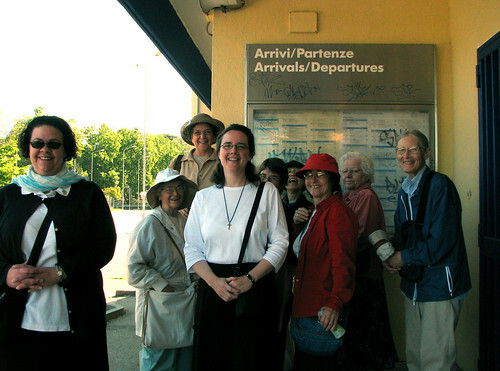 One of the features of the Benedictine Rome Renewal Program – something that separates it from the usual tour – is its emphasis on living in Rome somewhat as the citizens do. So we will travel around Rome using the train, bus, and metro systems. Acclimated to the Casa and the neighborhood, today we received our first practicum (having had the lesson yesterday). 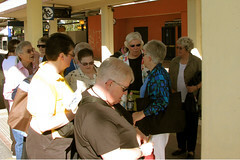 Our Treno 101 experience included a lesson in careful reading of the schedules. Not all trains stop at our station. This isn’t a problem when we’re going somewhere: it just barrels by and we keep waiting. It’s a major problem when we’re returning: our tickets are only good as far as our station, with a 50€ fine if we’re found beyond our station – which is exactly where we’ll be if we get on the incorrect train. I really appreciate this approach to visiting Rome. We will see the sights, certainly. But not from inside the bubble of a tourist coach where we don’t encounter much of the culture of the city, or a feel for how people live. Part of our Treno 101 class included a segment of an old 20/20 show focusing on pickpockets and street theft through various scams. Every year, they tell us, someone loses something to street thieves, but with diligence, it can be kept to a minimum.